Harriet Manners knows more facts that most. She knows that New York is the most populous city in the United States. She knows that its official motto is “Ever Upward”. She knows that 28% of Americans believe we never landed on the moon. So, it turns out this wasn’t the finale of the trilogy like I had thought it would be. In fact, I can’t see an end in sight. With little of an overarching plot, Harriet’s modelling/teen drama adventures could continue on for many books to come. At least I can say they’re fun—fluff, but fun. Some of Harriet’s antics did irritate me this time, but I still didn’t want to stop reading. I think I’m hooked. Books two and three haven’t been as funny, though. The burst-out-in-fits-of-laughter humour seems to have been tamed down in favour of focusing on Harriet’s love life. And while I missed that, honestly, it was about time we got to see why Harriet liked this boy so much. The romance was really what held this series back. Nick has been the most absent love interest I’ve encountered in YA. He pops up a few times each book, says or does something that gets Harriet thinking he’s dreamy, then he’s off again. I let it go because I wasn’t reading these books for the romance; I read it for the modelling, for the friends, for the Alexa bitchiness, for Harriet’s ‘maverick’ dad, for Annabel, for her grandma, Bunty, Yuka Ito, Wilbur. All of the characters bring something special to the series that just makes you want to live inside the book. And then there was Nick. I don’t know why he came off so blah compared to everyone else. Perhaps it was because we were being forced into finding him attractive, this amazing boyfriend that he wasn’t. And that’s why I appreciated the direction of this book. Nick still doesn’t make much of an appearance—surprise, surprise—but that seems to have been circumvented with the introduction of these flashback chapters that show moments between Nick and Harriet. I’d liked getting the chance to finally meet Nick and Harriet as a couple, to get to see what makes them work, to see why Harriet actually likes him. With all of the focus on her and Nick, and Nick not being there, in typical teen angst style, Harriet magnified her problems, becoming quite needy and pouty whenever things didn’t go her way. Sure, it felt like the world was against her, but I don’t think that justified everything that she did throughout this book. There was a lot of deception involved, and I really wasn’t approving of any of it. The weird thing is I still enjoyed it. I had that gut-twisted, angsty feeling for a great deal of the book, but I flew through the pages. 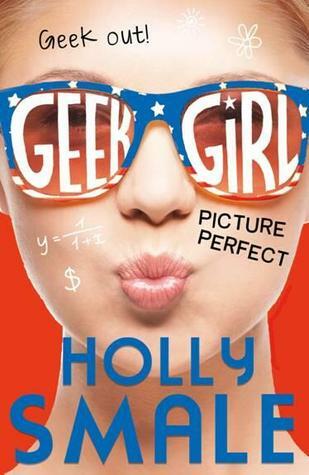 Meeting new characters, catching up with old ones, it did a good job of expanding the Geek Girl universe, while still drawing things back in as the book wrapped up in a story-of-the-week kind of fashion. While I think it could have used a bit more of the modelling world, the relationship focus did take things in a new direction which I’m looking forward to continuing. But please, with the next book, bring Yuka Ito back! Those after a quick bit of teen angst and quirkiness. This is one of my favourite series of all time! I wish you’d enjoyed it more though. I totally get that feeling, where it feels like you shouldn’t be enjoying the book but you do. I thought it was going to be a trilogy too, I kind of wish it was. As much as I love this series, I don’t know how much of Harriet’s story there can really be to tell.